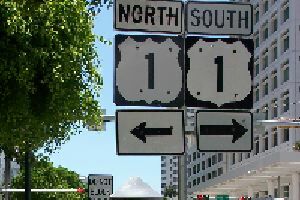 Ever since I placed a box at the north end of Hwy 41 back in 2003, I wanted to also place a box at the south end in Miami. In the summer of 2009 I finally got my chance. Unfortunately, the area surrounding the south end of Hwy 41 does not make for easy letterbox hiding, so we'll see how long this box remains in place. If you go searching for this box, be prepared to pay for parking in downtown Miami (we found a parking garage close by on Brickell Ave between SE 8th and SE 7th), and to take your time to sneak the box out and back in place. 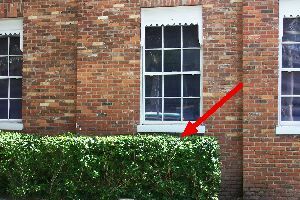 It is hidden in landscaping, so if you bring garden gloves and act like you are landscaping, you might go unnoticed that way. Also, if I had had a flat thin rock to place over the box and its hole I would have, so if you are able, please do so and let me know. Before retrieving and replacing the box, be sure no one is watching you (which could prove very difficult). I was in a group of four acting as tourists as we placed the box. The box is not camo-taped, so it is clearly seen as a harmless lock-in-lock container.